The haier water heater has a 2mm thick steel UMC tank(Ultra micro coated) with viterous enamelling protects the tank from corrosion. The tank is proved to pass 160,000 cycles impulse test under 10 bars, to ensure working pressure of 8 bars. 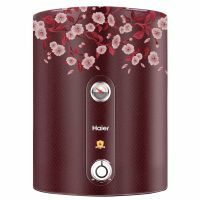 To Recieve updates and possible rewards for Haier ES25V-Color FR please sign in. To Recieve updates and possible rewards for Geyser/Water Heater please sign in.